Tomas Berdych enjoyed a surprisingly comfortable passage into the quarter-finals of the French Open on Sunday after dismissing fourth seed Andy Murray with ease on a gloomy Court Suzanne Lenglen court. 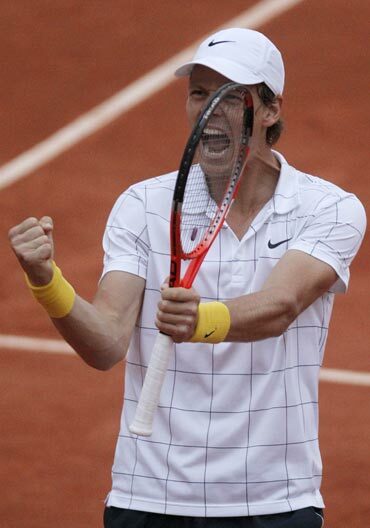 With daylight dwindling on a cool, windy day at Roland Garros, Berdych won a rain-interrupted match 6-4, 7-5, 6-3 to reach the last eight of a Grand Slam for only the second time. Murray, the highest seed to fall in the men's event, never got to grips with his opponent or the damp conditions, sliding to a rather tame defeat. The Scot grumbled about the state of the balls and looked miserable but could have few complaints after being outplayed by an opponent yet to drop a set here this year. "Maybe that's his style, you know, that he wants to like make the opponent sleep or whatever," Berdych, who has never managed to estblish himself in the top 10 despite a game tailor-made for the sharp end of Grand Slam tournaments, told reporters when asked about Murray's tame display. "Whatever it is it didn't work today for him, and I'm happy for it," added the Monte Carlo-based 24-year-old. 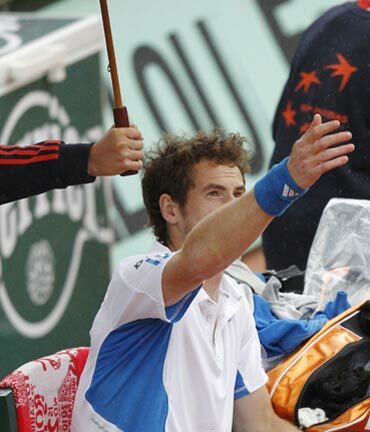 "I would say that he didn't give me too much pressure in the rallies, I was really comfortable. I mean, almost with all the points, all the shots, I had plenty of space to do everything that I wanted. That's why I won in straight sets," he added. 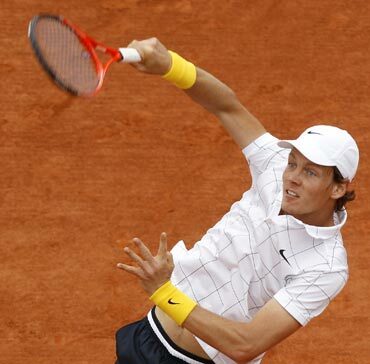 Berdych, the 15th seed, did have some sympathy with his opponent about the state of the balls. 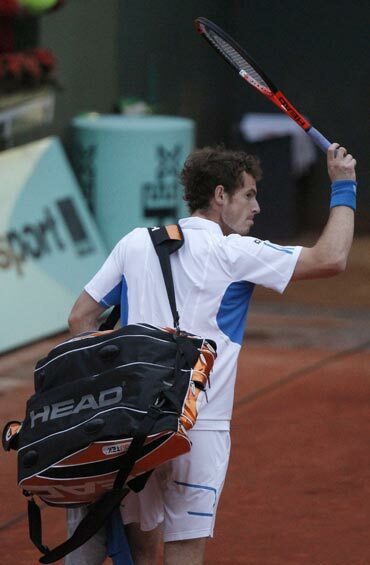 "Normally when you play on clay you get some clay on the ball which makes it a little bit dirty," he said. "But the balls today were like that after two games, covered with the clay. They were like all brown and it was tough to see," he added. Berdych, the 15th seed, broke the Murray serve in the eighth game on his way to taking the opening set and carved out a 2-0 lead in the second set before a Murray fightback was interrupted by rain with the Scot leading 4-3. When play resumed Murray was clearly not happy with the playing conditions and Berdych broke at 5-5 and then served out the set before rattling through the third to set up a clash with Russia's Mikhail Youzhny for a place in the semi-finals. 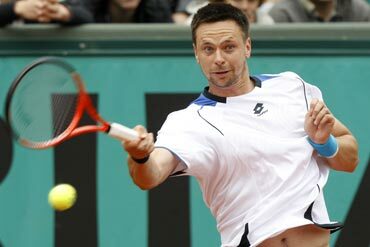 Swede Robin Soderling dismissed Croatia's Marin Cilic 6-4, 6-4, 6-2 in the fourth round of the French Open to set up a mouthwatering rematch of last year's final with holder Roger Federer. The fifth-seeded Soderling, who last year handed Rafael Nadal his only defeat at Roland Garros, perfectly read the Croatian 10th seed's service, breaking seven times. He managed to keep his cool in the key moments of the match as Cilic, who has never made it past the fourth round here, struggled to match the Swede's brutal strokes from the back of the court. Soderling was in no mood to stay too long on Court Suzanne Lenglen as he ended Cilic's ordeal after one hour and 40 minutes when the Croatian sent a forehand long. Local hope Jo-Wilfried Tsonga retired injured from his French Open fourth-round match against Russian Mikhail Youzhny.